Few manufacturers offer such a wide-ranging selection as Tissot. With classic mechanical watches housed in solid gold cases, modern solar-powered titanium sport watches, and even pocket watches, this Swiss manufacturer leaves little to be desired. The Tissot collections contain hundreds of different models; the Couturier from the T-Classic series has over 50 variations alone. Tissot's most important model series are the T-Sport, T-Gold, T-Lady, and the Touch Collection. The manufacturer is also a major player in the vintage field, as Tissot has a long tradition to look back upon. The company was founded as a family business in the middle of the 19th century. In 1930, they merged with Omega and today, they are a member of the Swatch Group. 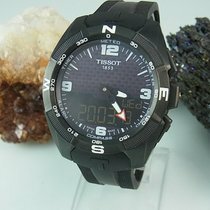 Tissot brings high-quality watches at affordable prices to the market. If you place a lot of value on functionality and precision, then you should consider a Tissot powered by a quartz movement. These watches remain affordable at under 500 euros. The high-tech T-Touch Expert Solar, however, costs around 1,000 euros. This Swiss manufacturer also appeals to lovers of classical mechanical watches. Some of their classic watches feature 18-karat solid gold cases and are priced in the four-figure range. No other company matches their range of different models. 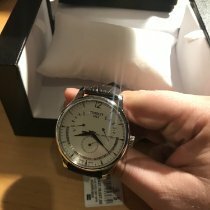 If you're looking for a watch with history, then Tissot is the brand for you. Models from past decades are still stylish watches, and many can be found at attractive prices. Tissot broke new ground in the world of wristwatches with their Touch collection. Similar to a smartphone, these watches have a touch screen with which you can control its numerous functions. The series has been around since 1999 and has since undergone further development. In 2014, the solar-powered T-Touch Expert Solar joined the collection. The series has a number of useful, notable features, especially for outdoor lovers. The T-Touch Expert Solar alone has a barometer, altimeter, altitude difference meter, stopwatch (chronograph), and an alarm. There is also a regatta timer for sailors, which counts down to the start of a race before transforming into a race chronograph. Furthermore, there is also a compass; it uses the minute hand to point north, while 12 o'clock represents the direction you're facing. Hours and minutes are displayed by hands in an analog fashion, while the rest of the information is digitally displayed at the bottom of the watch. Tissot chose a fitting material for the T-Touch's 45 mm case: titanium, which is matte, grey, extremely robust, and 40% lighter than stainless steel. It's also suitable for those who are allergic to stainless steel. Comparable watches in this price range can be found in the Promaster series from the Japanese manufacturer Citizen. The T-Sport collection really does live up to its name, as it contains a number of robust sport watches which are largely defined by their functions. The watches in this series, with their tachymetric scales and circular subdials, emphasize different features than those in the Touch collection. For one, the T-Sport collection is modeled after its predecessors from the 1960s. Another important difference: The T-Sport is also available with mechanical movements. The caliber C01.211 powers the PRS 516 Extreme and has been available since 2009 from ETA, the largest ébauche manufacturer in the world. The chronograph function times periods up to six hours. The watch is on the larger side, with its stainless steel case measuring 44.4 mm in diameter. The PRS 516 Extreme is waterproof to 10 bar, equivalent to 100 m underwater. The Tissot Seastar 1000 from the T-Sport collection is the best watch for diving to deeper depths. It is waterproof to 30 bar (300 m) and has a rotating bezel to keep track of the dive time. At the same time, it's the largest T-Sport model with a case diameter of up to 48 mm. The mechanical movement C01.211 also powers the Seastar. The quartz movement G10.211 powers the majority of the T-Sport models. The Tissot V8 is powered by this caliber, for example. This watch resembles the Omega Speedmaster Professional in its design: They both feature a black dial and tachymetric scale as well as a stainless steel case and three subdials for the stopwatch function and subsidiary seconds. Its diameter of 42 mm measures the same as Omega's so-called Moonwatch, though the price of the Speedmaster Professional exceeds the Tissot V8 by a four-figure sum. Tissot's T-Gold collection features some of the manufacturer's more expensive watches. The Bridgeport Automatic from this collection is an elegant, classic chronograph available with either a stainless steel or solid 18-karat gold case. The Valjoux 7750 from ETA, first manufactured in the early 1970s, powers this watch. It's one of the most well-known and best automatic mechanical calibers with a stopwatch function. Countless famous manufacturers use the 7750 to power their watches, such as TAG Heuer and IWC. The Oroville Automatic is a simple 18-karat gold watch with three hands and a date display at three o'clock. It is powered by the ETA 2824-2, a movement also found in the Carson Automatic. The Carson Automatic has a classic look as well and features a dial with large Roman numerals. Several women's watches are also part of the T-Gold series: the Organdy, the Pretty, the Glamorous, and the Caliente. Tissot has a long history of producing women's watches which began when they introduced their first women's watch in 1911. Over 15 different women's watches are available in the T-Lady collection, some of which are decorated with diamonds. The T-Classic series contains more than 20 men's models, among them the PR 100 and the Couturier which both have some 50 different versions. The designs of the T-Classic watches are, as their name suggests, rather conservative. Quartz movements are used as frequently as mechanical ones. Some models of the Chemin des Tourelles and the T-Complication Squelette forego a dial, instead showing off their balance wheel and gears. Tissot is one of the few manufacturers still producing pocket watches to a noteworthy degree. The T-Pocket collection encompasses about 10 different models, some with more than a dozen varieties each. The Tissot Specials is available with a classic, 53 mm brass case and is powered by an ETA 6498 movement that was developed by Unitas in the 1950s. Models with quartz movements are also part of the T-Pocket series. Even the super modern Touch is available as a pocket watch. However, most of the T-Pocket models have a nostalgic flair about them, invoking memories of the mid-19th century when wristwatches were a thing of the future. Charles-Félicien Tissot, a fitter of gold cases, and his son Charles-Emile, a watchmaker, founded the company Tissot & Fils together in 1853. They assembled externally produced parts to complete watches and primarily exported them to Russia and America. In 1930, Tissot merged with Omega to become SSIH, the Société Suisse pour l'Industrie Horlogère. In the same year, Tissot also presented the first ever wristwatch unaffected by magnetic fields. 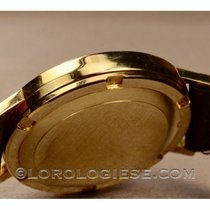 In the 1980s, the Swiss manufacturer attracted a lot of attention by producing watches with unique case materials, such as the Rockwatch (1985) and the Woodwatch (1989). Tissot has been a part of the Swatch Group since 1998. They are also the official timekeeper at countless sporting events from the MotoGP, the premier class of motorcycle racing, to the Tour de France and the Australian soccer league.